Teton Therapy is committed to the health and well-being of Wyoming communities. 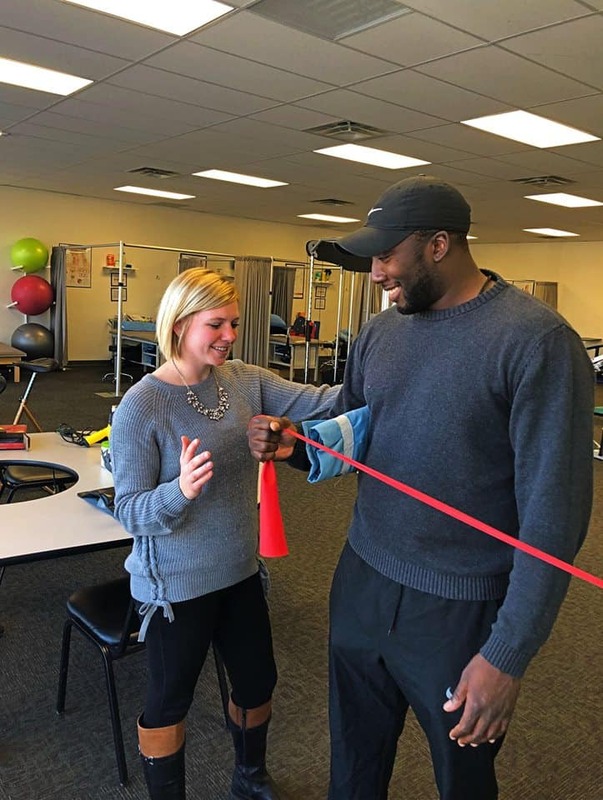 Patients that receive physical therapy and occupational therapy from our staff are treated like family and are our number one priority. A Cheyenne patient, Joseph Bates, has seen a difference in his everyday life thanks to Teton Therapy! Ashton Hanson PT, DPT (left) helps Cheyenne patient, Joseph Bates (right), with his exercises. Joseph Bates has been coming to Teton Therapy in Cheyenne, Wyoming for over six months, for two different physical therapy treatments. His doctor diagnosed him with compartment syndrome for his leg. Compartment syndrome is a painful condition that happens when pressure within the muscles builds to dangerous levels. This disrupts blood flow to muscles and nerve cells. His physical therapy program helped relieve his compartment syndrome greatly. As a result, Joseph returned to Teton for a new injury. on his right shoulder and torn tendon in his bicep. After his leg problem, Joseph tore a tendon in his bicep and had pain in his right shoulder. When you tear a tendon on your bicep, you lose strength in the entire arm. This makes it very painful to do daily tasks such as opening your car door, carrying grocery bags, or picking up your children. So, if you have this injury, a physical therapist can help you recover. They develop a program of stretching and strengthening exercises that help restore strength in the shoulder and repair the torn tendon. Ashton Hanson PT, DPT (left) helps Cheyenne patient, Joseph Bates (right) with physical therapy exercises. The shoulder is one of the most complicated and mobile joints on the human body. It is surrounded by different muscles and tendons, and it is important for our daily movements and activities. If your shoulder isn’t functioning well, it may result in pain, decreased range of motion, and weakness. 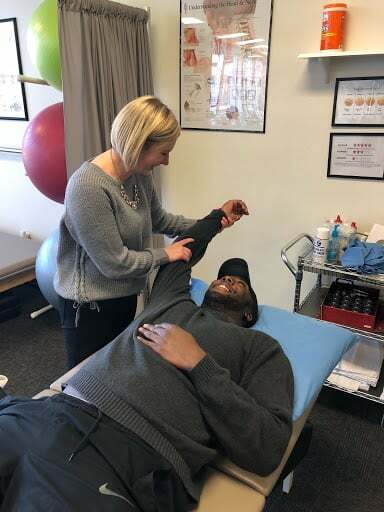 At Teton Therapy, we design a comprehensive, individual treatment plan that addresses your shoulder pain, and gets you back to doing the important things in your life! Why wait? Call today for a free consultation and see how Teton Therapy can help you!